Regular readers will know that I’m a sucker for wood. Show me something well-crafted from an attractive chunk of wood and I’m on board. As docks go, this is a low-tech one. There are no connectors or electronics – it’s a purely passive dock designed simply to minimize the space your MacBook takes on your desk when you’re not using the built-in screen or keyboard. It comprises two pieces of wood (walnut or maple) held together with an aluminum plate, plus two rests inside made from a mix of wool and resin to avoid scratches. Your desk is similarly protected by cork matting on the underside. You can use it simply as a way to store your MacBook when not in use, or you can connect power and Thunderbolt cables to use it with an external display and keyboard. Grovemade is an American company which uses domestic hardwoods, and its products are handcrafted, so you should be getting a quality product – and both the look and feel do live up to expectations. 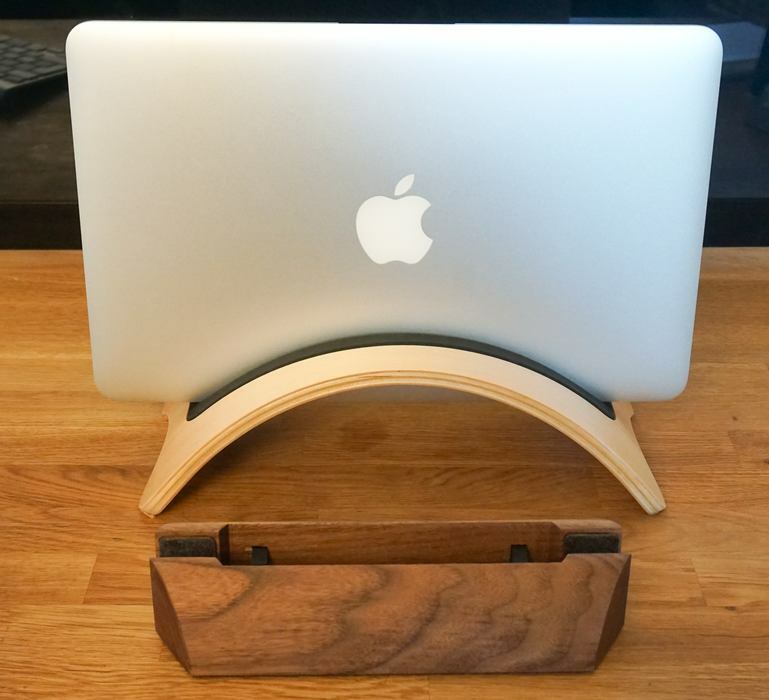 It’s a beautiful piece of wood, feels solid, is appropriately weighty without being heavy – and the MacBook slips easily into place without the dock sliding away from beneath it. It’s held firmly, so you do need two hands to remove it. 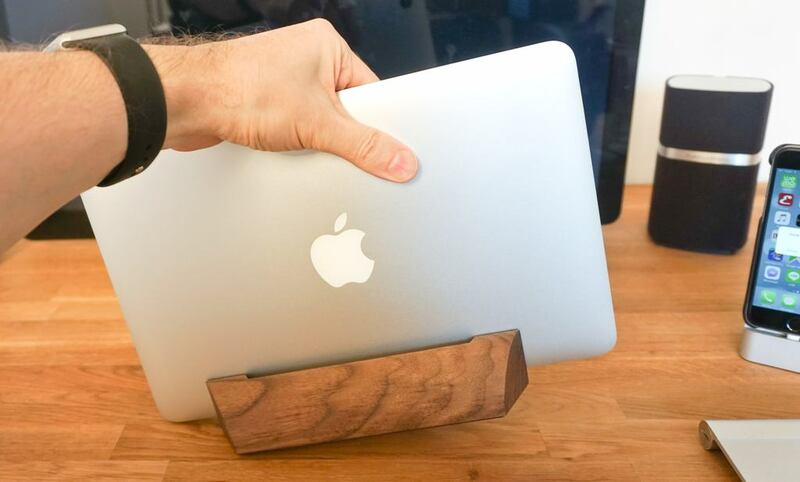 Try to lift it out with one hand, and the dock comes with it. It’s not cheap, at $79. That is a fair chunk of change for a piece of wood, but if you appreciate quality products, I don’t think you’ll regret the purchase. If you like the idea but find the price a bit steep, there are a range of other wooden docks available on Amazon starting from around $25. Finally, if you prefer aluminum to wood, there’s TwelveSouth’s BookArc, another manufacturer I rate highly. Update: TwelveSouth also makes a wooden version too now. We already did a hands-on with the aluminum model, so I’ve just added a few comments below. As you’d expect from TwelveSouth, this too is a beautiful piece of wood (the maple version is shown). The company takes a different approach from Grovemade, opting for a ‘one size fits all’ stand with two different rubber inserts. While I generally prefer to be looking only at wood with these things, the black rubber does look smart. In use, it’s just as solid as the Grovemade dock. There’s a small cable clip underneath that allows you to run cables from one side to the other if needed. Choosing between the two will really be down to personal preference on the design and choice of woods. Personally, I’d be equally happy with either of these gracing my desk. If you’re having trouble choosing, the BookArc mod is $20 cheaper. 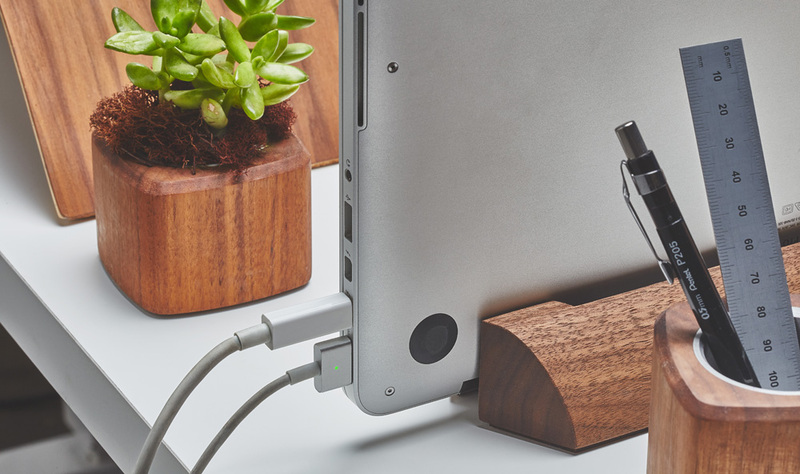 The Grovemade MacBook Dock is available in a choice of walnut (shown above) and maple via the company’s website at $79.